Phil Burger is the founder of Burger & Brown Engineering, Inc. in Grandview, MO and currently serves as Scientific Cooling Instructor. 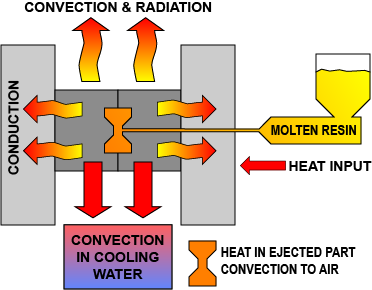 This page is designed to show the calculation steps to figure heat transfer from an injection mold through the clamp plate and into the platen. L = plate thickness, ft.
L = 1.875/12 = .149 ft.
Heat Transfer Rate, Q = ΔT/R1 = 85/.0089 = 9551 BTU/hr. Heat Transfer Rate, Q = ΔT/(R1 + R2) = 85/(.0089 + .022) = 85/.031 = 2742 BTU/hr. Q = ΔT/(R1 + R2) = 85/(.0089+.022) = 85/.031 = 2742 BTU/hr. This change results in lower energy cost and greater process stability.